The Urban Mining Company (UMC) have transformed the way we extract the rare metals used to produce cutting-edge magnets that enable modern technology. Texas based, they recycle metals from old electronics and were recognised by the Ellen MacArthur Foundation for establishing a Circular Economy. The UMC wanted an explainer video highlighting their alternative approach to the production of Neodymium magnets. They wanted to create awareness and a call to action around the recycling of electronics in the public, also reaching potential investors. Our challenge was to show how important magnets have been and are to our civilisation, highlighting the large amounts we waste and the missed recycling opportunities. Our film emphasises the role magnets have played throughout our history, and the essential role they continue to play. Explaining the environmentally harmful process of mining rare metals, it shows the massive amount of technology thrown away. Calling for more recycling of electronics, the UMC explain how they recycle and rebuild magnets in a better and more sustainable way. Using a compass as a set piece, visuals contrasted the destructive way rare earth metals are mined with the UMC’s revolutionary recycling and rebuilding process. Visual metaphors such as ships, MRI scanners and space shuttles augmented these -underpinning the way magnets are an essential part in our most powerful technology. Combined they delivered the UMC’s call to action and message to the public in a thought provoking way. 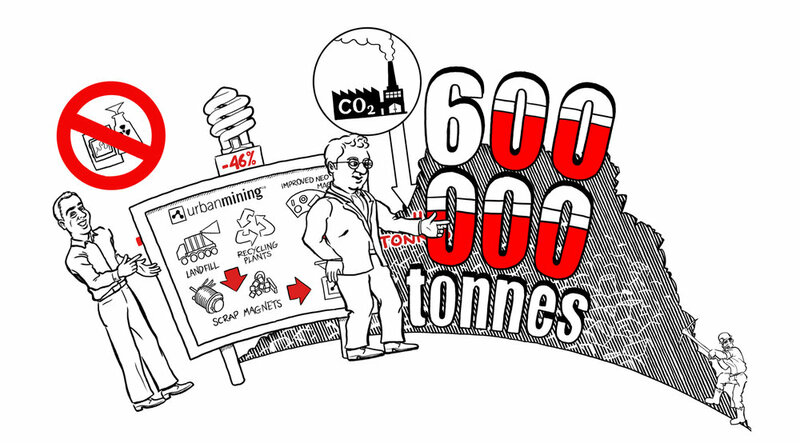 Find out more about the recycling and production technologies used by the UMC here.